I don't know where the discrepancy comes from. So, technically, Hillary did win the popular vote for the nation. But she did not win the popular vote for: Alabama, Alaska, Arizona, Arkansas, Florida, Georgia, Idaho, Indiana, Iowa, Kansas, Kentucky, Louisiana, Michigan, Mississippi, Missouri, Montana, Nebraska, North Carolina, North Dakota, Ohio, Oklahoma, Pennsylvania, South Carolina, South Dakota, Tennessee, Texas, West Virginia, Wisconsin and Wyoming. Al Gore also won the popular vote, but George W. Bush was elected. This week's election is the fourth or fifth time in our country's history that the person with the most vote didn't win. 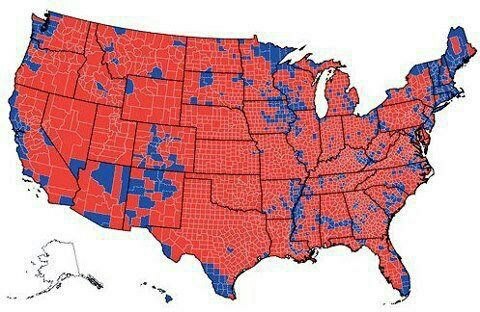 It's indicative of the need for electoral college reform. I disagree. The founding fathers knew what they were doing. Yeah I remember all that with Gore and Bush - don't know how the popular vote went state by state though. If we went by popular vote though, in this election - state by state then Trump would of won his states. Anyway, the little states and all wouldn't have a say. I think it's fair. We are not a Democracy- we are a Democratic REPUBLIC and that is what people don't get. We are too big and too populated, for a fair election. You know, it is what it is. It is still far better than any other country. It is what it is! Fair or not fair! It's over and we have to get behind this President-Elect and pray for the best!